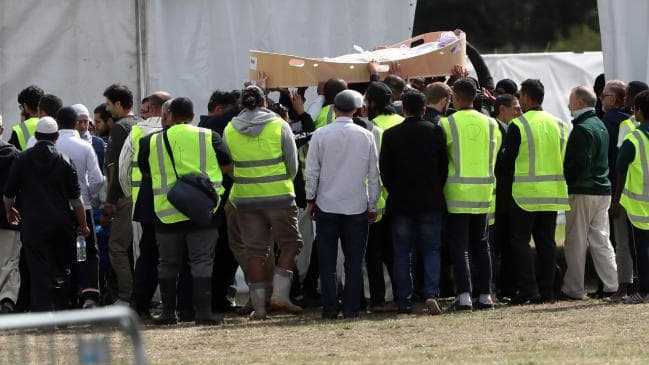 THE first burials for victims of the Christchurch massacre are being held today, as reports claim people have been sacked for watching the gunman's chilling livestream. The first two bodies arrived at the cemetery for prayers and burial shortly before 1pm local time (11am AEDT). 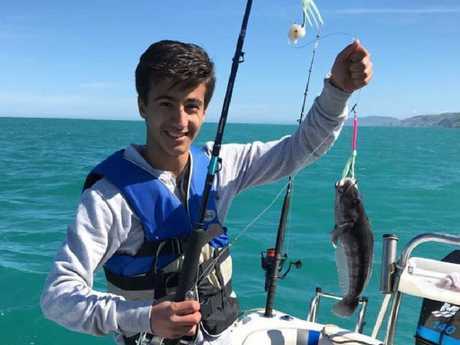 They were named as father and son Khaled and Hamza Mustafa, who had arrived in New Zealand only months ago from Syria to start a new life. Khaled was 44 and Hamza was just 15. 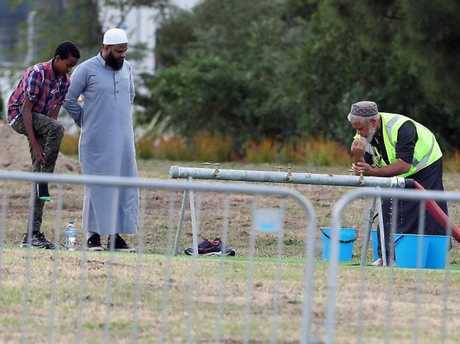 Both died at the Al Noor mosque - Hamza while he was on the phone to his mother. Hamza's younger brother, Zaid, was also shot in the mosque but will survive. The family were welcomed to New Zealand in 2018 after spending six years in a refugee camp in Jordan. Wife and mother Salwa told how Hamza rang her when the shooting began. "After that I heard shooting and he screamed and after that I didn't hear him," she was reported as saying. The deceased were carried from a van in an open casket and wrapped in a white shroud. Their bodies were carried high and taken into a marquee for the final Salatul Janazah rites. Several hundred people were in attendance, the men and women separate from each other. After a very brief prayer ceremony lasting less than 10 minutes, both victims were carried to their graves and placed immediately in the ground. There is a heavy police presence at Memorial Park Cemetery as police ring the perimeter nursing semi-automatics to protect family members who are arriving for the first burials. Mourners will say prayers at a marquee the council has set up on the cemetery lawns after which only male family members will accompany bodies to the gravesites. Although 50 graves have been dug, not all will be used as some of the victims are to be repatriated to their country of birth. The identities of those being buried will only be released according to the wishes of families. Outside the funeral, Jamil el-Biza from Australia's ASWJ, or Ahlus Sunnah Wal Jamaah, turned on Prime Minister Scott Morrison. He said Australia "needs to learn from the prime minister of New Zealand how you treat Muslim people in times of hardship. That is a direct message to Scott Morrison. Scott Morrison really needs to show the Muslim community in Australia that he's on their side. That might be hard given his past." 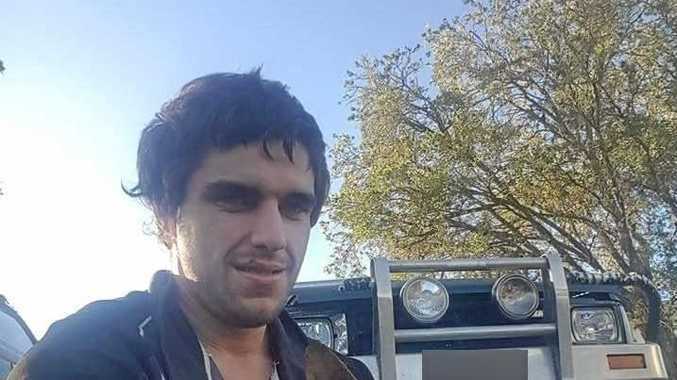 New Zealand Herald is reporting at least one individual has been fired for accessing Australian man Brenton Tarrant's Facebook livestream, and others have been "let go for sharing it woth workmates". The newspaper cites corporate computer monitoring system, Cyber Research. A New Zealand lawyer told the newspaper the sackings could be challenged. "I'm aware of a lot of employees trying to get access to this content out of concern," employment lawyer Jennifer Mills told the NZ Herald. "People are grappling and trying to come to terms with the shootings, which has led some seeking to see what happened."